Prior to last year, Brussels Sprouts and I had never crossed paths. Perhaps it was because I was brought up thinking that these little green spheres were meant to taste putrid, and that I should avoid them at all costs. (In reality, I think it was just because my mother didn't like them herself.) Whatever the case, I discovered cabbage's baby cousins while on holiday abroad, and I have been eating them happily ever since. Lately, I've been hum-ho while cooking (aka, lazy) and eaten most of my veggies straight-up steamed. Tonight however, I decided that it was time to spruce things up. A gander into my fridge led me to throw in a dash of this, a sprinkle of that, and before I knew it, voila! A delightful honey garlic sauce was born. chop brussels sprouts into thin pieces. chop garlic into large chunks. whisk together oils and honey. toss mixture with brussels sprouts into a large frying pan. over medium-low heat, cook until desired tenderness is reached (about 10 minutes). 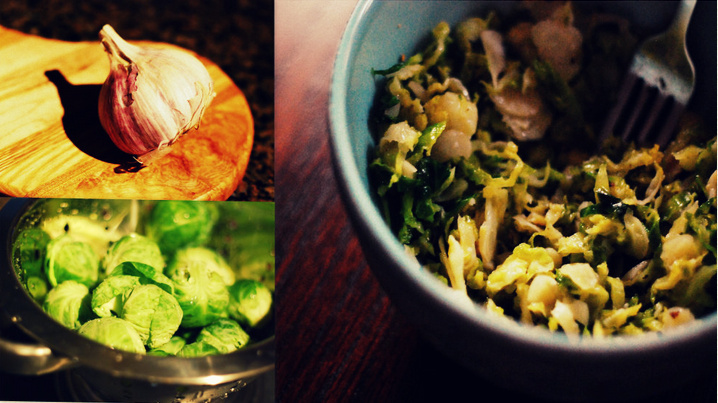 If brussels sprouts begin to brown too quickly, toss in 2 to 4 tbsp of water and cook until water evaporates. sprinkle with desired amounts of salt and pepper just before serving.